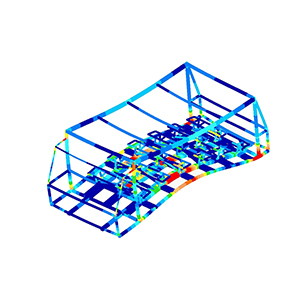 FEA-Solutions (UK) Ltd - Finite Element Analysis For Your Product Design | 417: Themepark Ride FEA of a themepark ride, carrying up to 30 passengers, subjected to quasi-static and modal analyses. The project comprised of the carriage (shown in image), the motion base and a number of sub-assemblies. For each, several design scenarios have been analysed. The reports have later been checked by TUV and accepted without any changes.